Todays card can be either a circle or a square...I chose a square. called Be Happy. The sheet of hexagons caught my eye ...and shape and size wise it worked with the sketch. 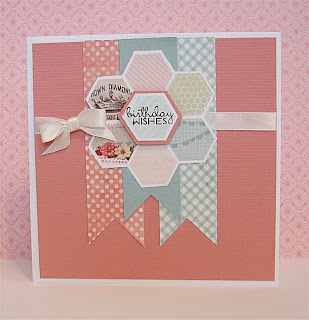 As luck would have it the birthday wishes sentiment from Verve's Joyful Blooms fit exactly inside a hexagon. I stamped it , cut it out backed it in cardstock that was the same color as the card front and used pop dots to add some dimension. Banners were cut from papers from the same paper pad , added satin ribbon and a bow and the card was done!